Black Badge #3 – I am very impressed with this title. 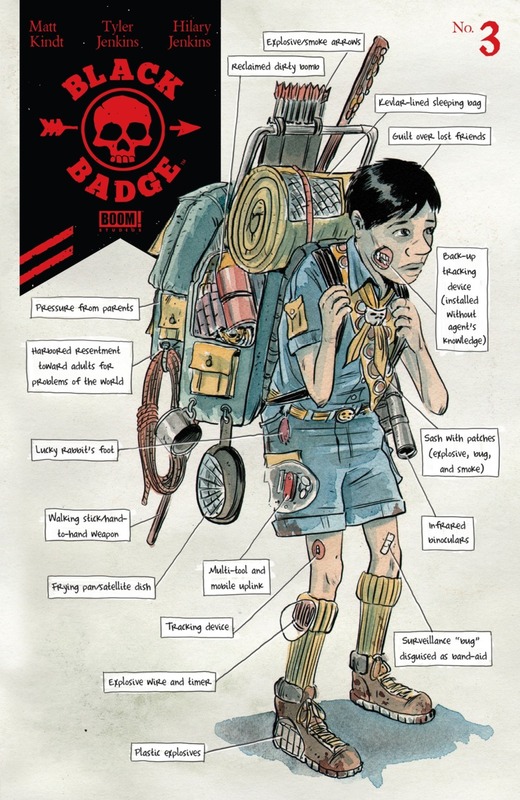 Matt Kindt and Tyler Jenkins have put together a compelling world where Boy Scouts operate as black ops teams. The Black Badges are in trouble with their handler after the way they executed their last mission, but their squad leader has managed to get them an assignment that might also lead to their missing, presumed dead, former teammate Jimmy. That leads them to Pakistan though, and puts them in danger of confronting Hook Hand, a mysterious figure that hunts Scouts like them. I like how Kindt has taken the classic campfire horror story and made it a real threat. This is the first issue that isn’t a done-in-one, and it has me looking forward to the next, as the larger story starts to reveal itself. Astonishing X-Men #16 – I guess there’s only one issue of this series left, and I’m okay with that, as Matthew Rosenberg’s oddball X-team has gotten mired in Havok’s uselessness as a leader and hero, which doesn’t really fit with how we’ve seen him portrayed in the past. Also, too much Greg Land art. I’d be dropping this if it weren’t ending. 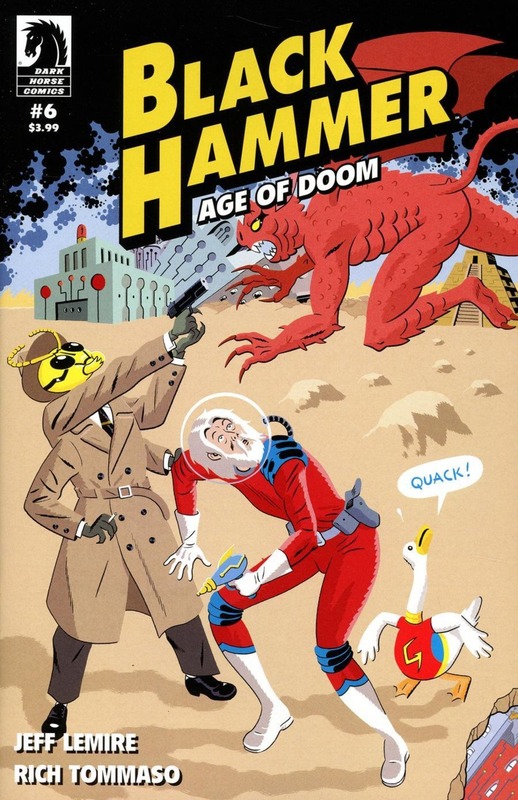 Black Hammer: Age of Doom #6 – Rich Tommaso joins the book to provide the artwork as Colonel Weird finds himself in a very strange world that is populated by forgotten comics characters. Tommaso is the perfect artist for this strange issue, as Jeff Lemire adds yet another dimension to his sprawling storyline. Last issue, I thought we were moving closer to the end of this story, but now I’m not so sure. I do know that this comic is never going to be about a bunch of aging superheroes trapped on a rural farm again, and I’m not sure how I feel about that; I really liked that stuff. Cemetery Beach #2 – We get a little better understanding of the structure of the human colony that was established on another world decades ago, as the main character, a military scout sent to explore the world, and his dissident companion, run from the establishment. It’s an action-heavy book, without much of the subtlety of a typical Warren Ellis comic, but it’s entertaining. Daredevil #609 – I’m not sure why we’re killing off Daredevil now, but it’s time for the new arc to be called “The Death of Daredevil”, which suggests how it might all end. This issue opens with Matt Murdock getting hit by a truck, and follows from there to show how Matt decides to change his plan of attack against the Kingpin. Phil Noto provides some of the nicest art I’ve seen from him (which is saying a lot), and Charles Soule gives the story a real sense of urgency. It’s good, but I’m not sure what the future holds for this title, aside from the fact that this is Soule’s last arc. Darth Vader #22 – Vader communes with a long-dead Sith who is going to help him prepare his new home on Mustafar in an issue that feels a little like it’s trying to extend this arc to be long enough to fill a trade. I like what Charles Soule has been doing in this pre-Episode IV series, but the pacing can feel off at times, like this one. East of West #39 – It’s back, and a lot happens. The House of Mao marches to war against the Endless Nation, while the Horsemen get closer than they’ve ever been to finding Death and Babylon. Jonathan Hickman and Nick Dragotta have been pretty slow getting this book out of late, but the quality remains high. I am always impressed by just how much stuff Hickman has happening in this comic. Gideon Falls #7 – Jeff Lemire and Andrea Sorrentino’s new series starts its second arc with some forward momentum. Norton and his psychiatrist begin to work towards uncovering the mystery of the Black Barn, despite some opposition, while the Sheriff remembers some facts about her brother that might be linked to his disappearance. This is a very interesting series that is hard to predict, with beautiful Sorrentino art. 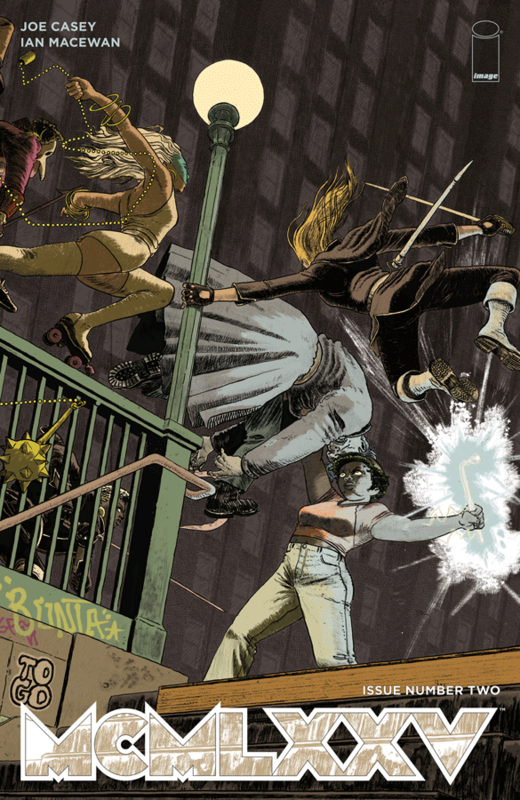 The New World #4 – I guess one potential problem with blowing up your entire life to help a girl you’ve just met and feel like your in love with is that you might not actually get along all that well with the girl at times. Kirby deals with trying to figure out how to proceed with everything, as Maximus begins to close in. Ales Kot and Tradd Moore are telling an exciting story here, and this is another strong issue. 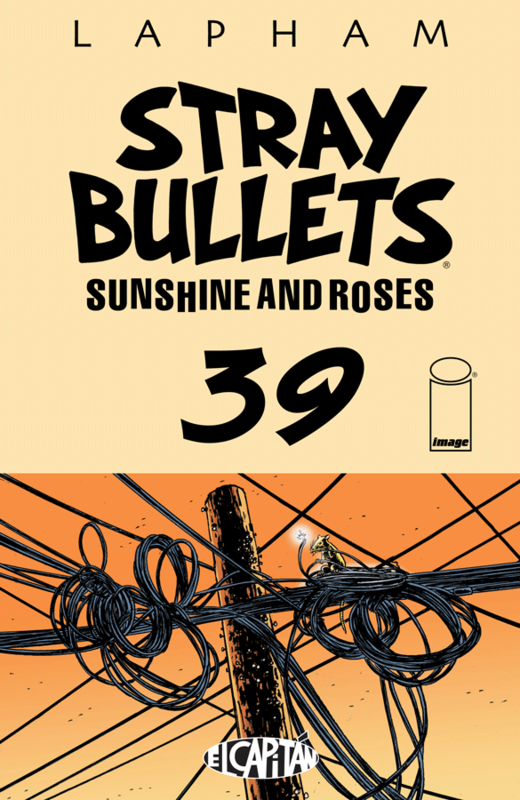 Stray Bullets: Sunshine And Roses #39 – We back up a little from the last two issues, and follow Kretch as he tracks down Orson, hoping in turn to find Beth and get the payback he’s been waiting for. We see what’s up with Annie, Love, Vic, and Chandra. At this point, this story has been running almost as long as David Lapham’s original Stray Bullets run, and I wonder if it’s going to be ending anytime soon. Part of me hope it never ends, while another part of me wants to see Lapham explore some of the other characters in this crime-filled world. 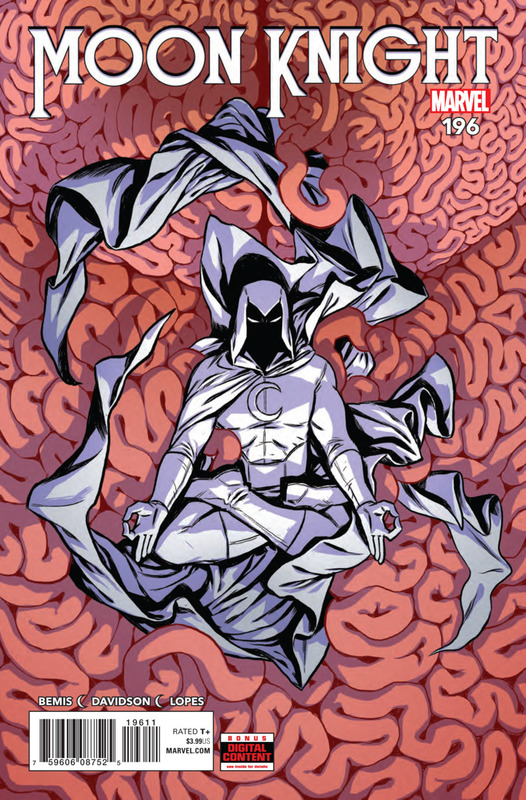 Moon Knight #196&197 – I’m not sure why I discounted Max Bemis before now, but he’s really worked to show a unique vision of Moon Knight. In a lot of ways, this book is reminding me of the some of DC’s pre-Vertigo weirdo series, as MK attends a special dinner for sick killers, and also tries to purge a bizarre hivemind of evil intentions. The art, by Paul Davidson and Jacen Burrows, is terrific. X-Men Gold #34 – This series is just kind of limping towards cancellation at this point. I’m not sure that it made much sense to put Marc Guggenheim in charge of the X-Men; he doesn’t have anything new to say about them, and retconning more of Storm’s past doesn’t work for me. 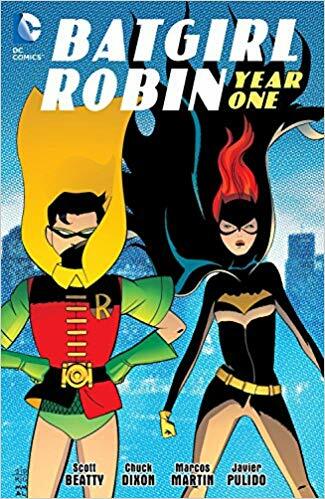 Batgirl/Robin: Year One – This nice thick trade is full of artwork by Javier Pulido (the Robin chapters) and Marcos Martin (Batgirl’s story). Is there any other reason needed to buy it? We get a pair of decent stories that look at the earliest days of Batman’s two longest-lasting partners, and some really excellent pages (although both Pulido and Martin are even better now than they were when they drew this). I enjoyed it. Punisher Max: The Complete Collection Volume One – I’ve never actually read Garth Ennis’s storied Punisher run, and thought maybe it was time to address that. To be blunt, I was pretty disappointed by what I found. This is all pretty standard stuff (with the exception of the excellent Born miniseries, which explores Frank’s time in Vietnam), and read like a weak attempt to Vertigo-ize the character simply by adding some bad words and some gross-out stuff (like the IRA bomber whose face is sliding off his skull). I’m not opposed to reading more of it, as they are decent comics, but I’m not going to be actively seeking the remaining volumes.